Ricco, from Holland sent along photos of a completed Kayak #11 , my stitch+tape design! 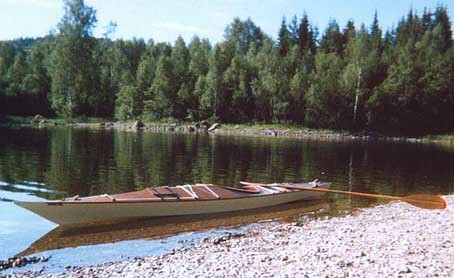 Sept. 1999- Ricco sent a new photo from his paddling trip to Sweden! "It's a stable, but good looking design, and suits my purpose of making camping-trips with a lot of luggage, and touring the dutch waters and abroad. It's not a fast boat and needs some power." "One other important thing to say is that this kayak is a head turner or however you say that in right english. I have had a lot of questions about the boat and people show a lot of interrest. It's not very common to see a wooden kayak in Holland. Most of them are colorfull "plastic" designs." "One of the old members of our kanoclub, he was dutch youth champion in his early days and has built his own kayaks in the past, said after a short trip in my kayak that it was perfect. For me that was a very important remark."